Welcome to TED Talks! This is one of my favorite places for inspiration and ideas, to understand the world around me—and to understand myself too. As the host of TED Talks India: Nayi Soch, I've pulled together a wonderful program of speakers—scientists, business leaders, artists and more—in the TED tradition to share with you. If you want to explore more ideas in TED Talks online, here are some favorites that will lead you down new paths of discovery. Please enjoy! "Best of TED Talks India," Episode 8 of TED Talks India: Nayi Soch. 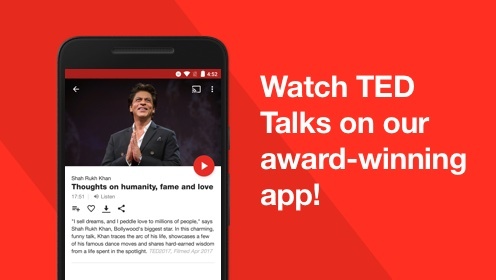 A brand-new TED Talks series in Hindi hosted by Shah Rukh Khan. This groundbreaking TV series showcases new thinking from some of the brightest brains in India and beyond. Brand-new talks, spoken in Hindi and hosted by Shah Rukh Khan. Interested in licensing TED Talks for commercial purposes? Get started with our Media Request Licensing Form.